Masquerade – Masks veil the identity of your mystery date until after the prom court in announced. Paris by Moonlight – This lovely romantic theme finally gives you a chance to speak French, if only for one night. Project Runway – Dressing in the best clothing is the game, complete with a fashion show. Casino Nights – Poker, Craps, or Roulette. You may even win a prize at the end of the night. Shanghai Nights – You may be inspired to go on summer vacation to China with this theme. Under the Sea – Remember the theme of the dance Marty’s parents attended in “Back to the Future”? This is that theme. Hollywood theme – This is an easy theme to setup, especially here in Southern California. Cinderella and Prince Charming – This could be the dream prom of two high school sweethearts. New York, New York – The prom committee would face the daunting task of making the dance hall or banquet hall look like New York as much as possible. “Decades” theme – Bring back the Roaring ‘20s or Disco ‘70s for a new generation. These are some classic, creative and fun prom themes. You could even come up with your own original prom theme and go down in your school’s history for creating a magnificent prom. Prom night is a significant point in your high school memories. Just remember that the prom theme isn’t everything; what counts is what you make of your night. Your WordPress blog has become the latest method towards adding more Twitter followers on the spot. The 42.5-acre Aisne-Marne Cemetery and Memorial in France (map), sits at the foot of the hill where Belleau Wood stands with its headstones lying in a sweeping curve. The cemetery contains the graves of 2,289 war dead, most of whom fought in the vicinity and in the Marne valley in the summer of 1918 during WWI. The approach drive at Ardennes American Cemetery and Memorial in Belgium (map) leads to the memorial, a stone structure bearing on its façade a massive American eagle and other sculptures. Within are the chapel, three large wall maps composed of inlaid marbles, marble panels depicting combat and supply activities and other ornamental features. The Brittany American Cemetery and Memorial in France (map) covers 28 acres of rolling farm country near the eastern edge of Brittany and contains the remains of 4,410 of our war dead, most of whom lost their lives in the Normandy and Brittany campaigns of 1944 during WWII inscribed along the retaining wall of the memorial terrace are inscribed the names of 498 of the missing. Rosettes mark the names of those since recovered and identified. The 4.5 acre Brookwood American Cemetery and Memorial in England (map) lies to the west of the large civilian cemetery built by the London Necropolis Co. and contains the graves of 468 of our military dead. Close by are military cemeteries and monuments of the British Commonwealth and other allied nations. Automobiles may drive through the Commonwealth or civilian cemeteries to the American cemetery. The Cambridge American Cemetery and Memorial site in England (map), 30.5 acres in total, was donated by the University of Cambridge. It lies on a slope with the west and south sides framed by woodland. The cemetery contains the remains of 3,812 of our military dead; 5,127 names are recorded on the Tablets of the Missing. Rosettes mark the names of those since recovered and identified. Most died in the Battle of the Atlantic or in the strategic air bombardment of northwest Europe. Corozal American Cemetery and Memorial is located approximately 3 miles north from Panama City, Panama (map) in the city of Corozal and is the location of 5,336 American veterans and others. A paved walk leads from the Visitor Center to a small memorial that sits atop a knoll overlooking the graves area. The memorial was established in 1923 by Congress to remember people that served overseas since 1917. It consists of a paved plaza with a 12-foot rectangular granite obelisk flanked by two flagpoles on which fly the United States and Panamanian flags. 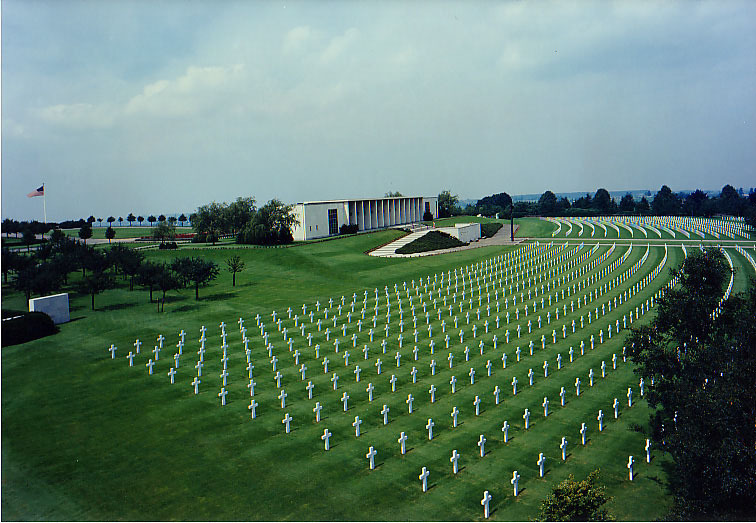 Epinal American Cemetery and Memorial is a United States military cemetery in Dinozé, France (map). The 48.6 acres (19.7 ha) site rests on a plateau 100 feet (30 m) above the Moselle River in the foothills of the Vosges Mountains. 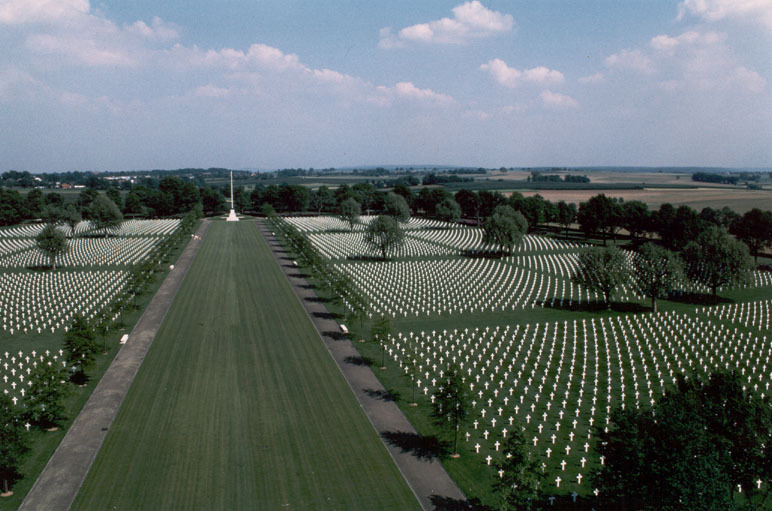 It contains the graves of 5,255 of the United States’ military dead, most of whom lost their lives in the campaigns across northeastern France to the Rhine and beyond into Germany during World War II. The Flanders Field American Cemetery and Memorial in Belgium (map) occupies a 6.2-acre site. Masses of graceful trees and shrubbery frame the burial area and screen it from passing traffic. At the ends of the paths leading to three of the corners of the cemetery are circular retreats, with benches and urns. At this peaceful site rest 368 of our military dead, most of whom gave their lives in liberating the soil of Belgium in World War I. Their headstones are aligned in four symmetrical areas around the white stone chapel that stands in the center of the cemetery. The Florence American Cemetery and Memorial site in Italy (map) covers 70 acres, chiefly on the west side of the Greve “torrente.” The wooded hills that frame its west limit rise several hundred feet. Between the two entrance buildings, a bridge leads to the burial area where the headstones of 4,402 of our military dead are arrayed in symmetrical curved rows upon the hillside. 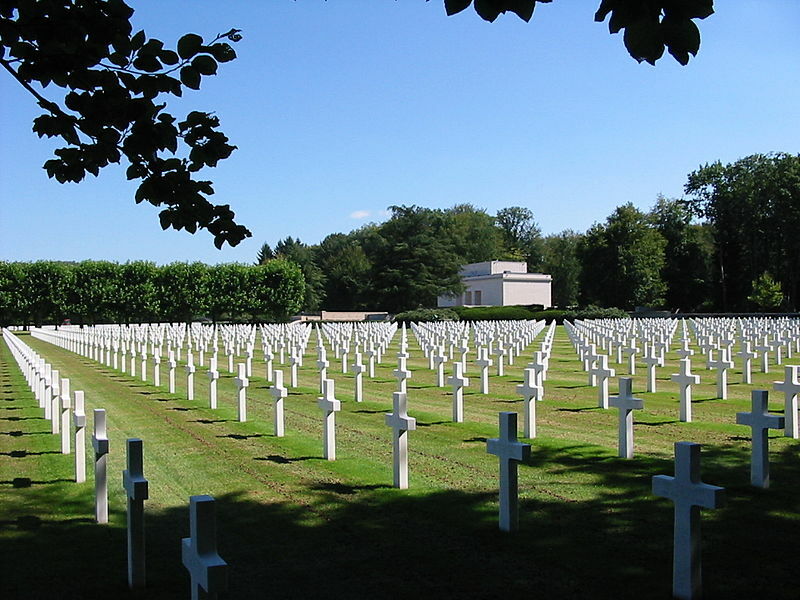 The Henri-Chapelle American Cemetery and Memorial in Liège, Belgium (map), contains the graves of 7,992 members of the American military who died in World War II. The Lorraine American Cemetery and Memorial in France (map) covers 113.5 acres and contains the largest number of graves of our military dead of World War II in Europe, a total of 10,489. Their headstones are arranged in nine plots in a generally elliptical design extending over the beautiful rolling terrain of eastern Lorraine and culminating in a prominent overlook feature. Most of the dead here were killed while driving the German forces from the fortress city of Metz toward the Siegfried Line and the Rhine River. The Luxembourg American Cemetery and Memorial in Luxembourg City, Luxembourg (map), 50.5 acres in extent, is situated in a beautiful wooded area. The cemetery was established on December 29, 1944 by the 609th Quartermaster Company of the U.S. Third Army while Allied Forces were stemming the enemy’s desperate Ardennes Offensive, one of the critical battles of World War II. The city of Luxembourg served as headquarters for General George S. Patton’s U.S. Third Army. General Patton is buried here. 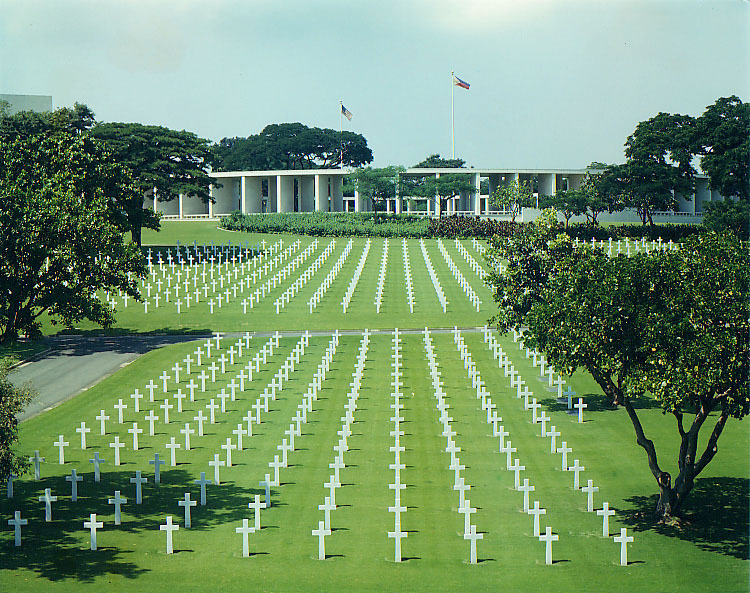 The Manila American Cemetery and Memorial is located in Fort Bonifacio, Taguig City in Metro Manila, Philippines (map) and contains the graves of 17,206 members of the American military. Within the Meuse-Argonne American Cemetery and Memorial in France (map), which covers 130.5 acres, rest the largest number of our military dead in Europe, a total of 14,246. 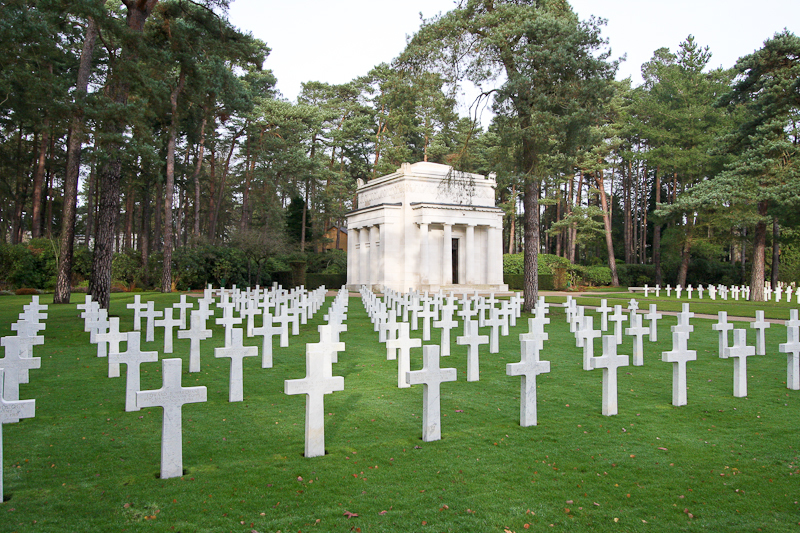 Most of those buried here lost their lives during the Meuse-Argonne Offensive of World War I. The Mexico City National Cemetery (map) was established in 1851 by Congress to gather the American dead of the Mexican-American War that lay in the nearby fields and to provide burial space for Americans that died in the vicinity. A small monument marks the common grave of 750 unidentified American dead of the War of 1847. The Netherlands American Cemetery and Memorial is the only American military cemetery in the Netherlands (map) and contains the graves of 8,301 members of the American military. The cemetery site has a rich historical background, lying near the famous Cologne-Boulogne highway built by the Romans and used by Caesar during his campaign in that area. The Normandy American Cemetery and Memorial is a World War II cemetery and memorial in Colleville-sur-Mer, Normandy, France (map), that honors American soldiers who died in Europe during World War II. At the 27-acre North Africa American Cemetery and Memorial in Tunisia (map) rest 2,841 of our military dead, their headstones set in straight lines subdivided into 9 rectangular plots by wide paths, with decorative pools at their intersections. 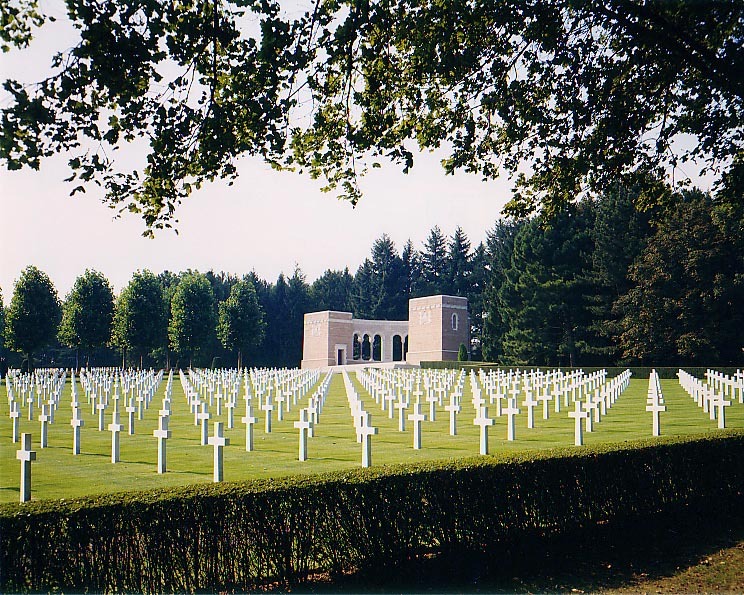 The Oise-Aisne American Cemetery and Memorial is an American military cemetery in northern France (map). Plots A through D contains the graves of 6,012 American soldiers who died while fighting in this vicinity during World War I, 597 of which were not identified, as well as a monument for 241 Americans who were missing in action during battles in the same area and whose remains were never recovered. Included among the soldiers here who lost their lives is poet Joyce Kilmer. 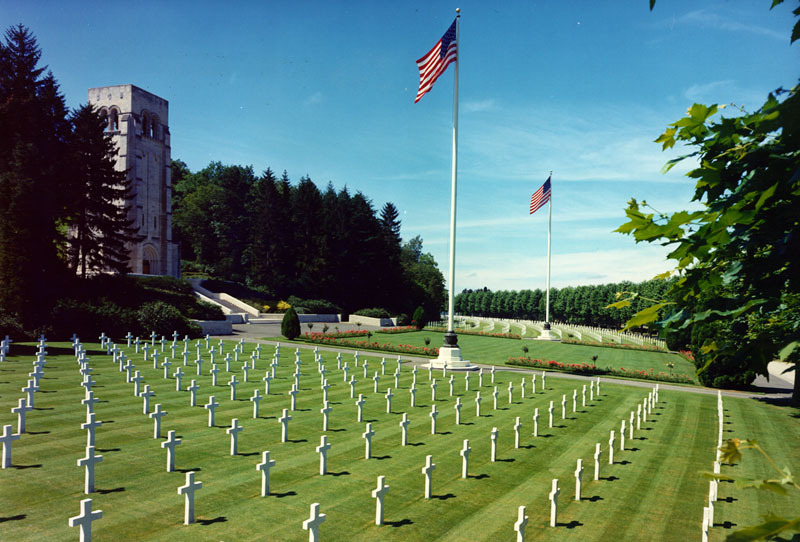 The site of the Rhone American Cemetery and Memorial in France (map) was selected because of its historic location along the route of the U.S. Seventh Army’s drive up the Rhone Valley. It was established on August 19, 1944 after the Seventh Army’s surprise landing in southern France. 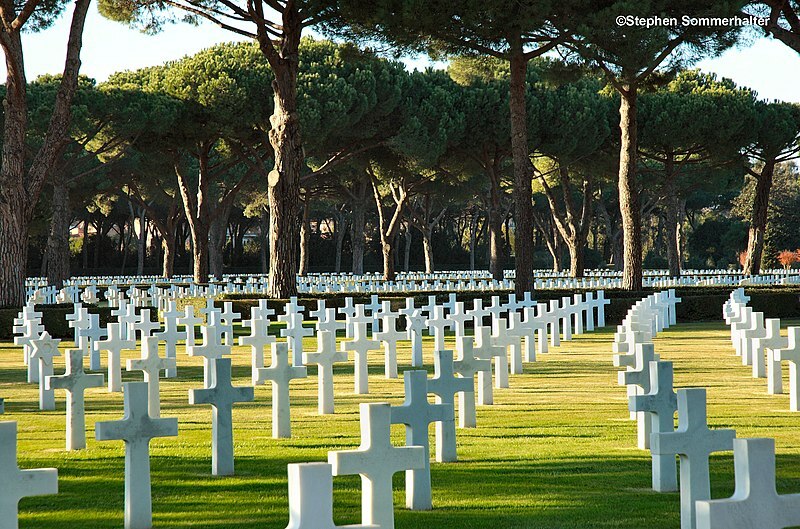 The Sicily-Rome American Cemetery and Memorial site in Italy (map) covers 77 acres, rising in a gentle slope from a broad pool with an island and cenotaph flanked by groups of Italian cypress trees. The Somme American Cemetery and Memorial in France (map) is sited on a gentle slope typical of the open, rolling Picardy countryside. The 14.3-acre cemetery contains the graves of 1,844 of our military dead. The St. Mihiel American Cemetery and Memorial in France (map) , 40.5 acres in extent, contains the graves of 4,153 of our military dead. The majority of these died in the offensive that resulted in the reduction of the St. Mihiel salient that threatened Paris. Originally a World War I cemetery, the Suresnes American Cemetery and Memorial just outside Paris, France (map) now shelters the remains of U.S. dead of both wars. The 7.5-acre cemetery contains the remains of 1,541 Americans who died in World War I and 24 Unknown dead of World War II. The United States Supreme Court ordered a massive inmate transfer to relieve California’s crowded prisons. 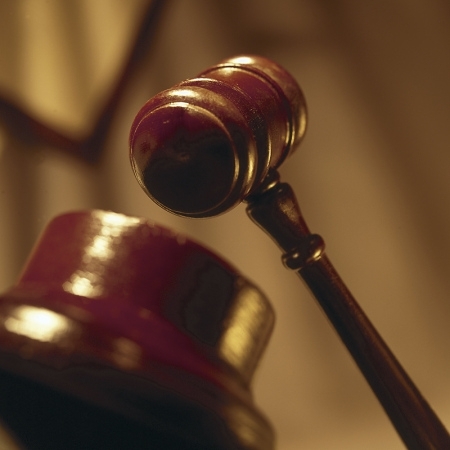 The Los Angeles Times stated, “The U.S. Supreme Court ruled that California must remove tens of thousands of inmates from its prison rolls in the next two years, and state officials vowed to comply, saying they hoped to do so without setting any criminals free.” Tens of thousands of inmates will be transferred from state prisons to county prisons in the next two years. The goal is to not release them at all, but to transfer custody of them. In the U.S. Supreme Court ruling and the L.A. Times, they made it sound as though prisoners would be released into society early, using the words “release” interchangeably with “transfer” when in fact, this is not the case. Neither the U.S. government, state of California, nor Los Angeles County intends to release any prisoners early. Housing prisoners in county jails for the time being will still cost a lot of money. However, there are plans to build more prisons in the future. Governor Brown proposed raising that money by extending the tax hike, which is due to expire on July 1st, 2011. Higher taxes may be, quite literally, the price we have to pay to keep criminals off the streets. 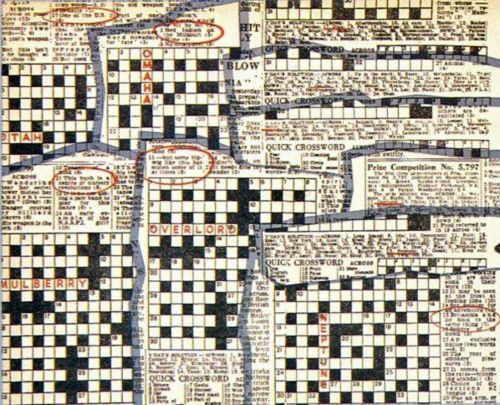 On December 21, 1913, the Sunday New York World printed a puzzle called the “word-cross” created by Liverpudlian, Arthur Wynne. The puzzle became an immediate success, eventually becoming a weekly feature of World. Sometime later, the name changed to “cross-word” and later still, the hyphen was also dropped. These two changes effectively shaped the crossword puzzle into the modern version we are familiar with today. Until 1924, crossword puzzles were only being printed in the New York World paper, but then, publishing company Simon & Schuster published a collection of World’s puzzles in book form, renewing the crossword puzzle craze. A collage of crossword puzzles from the Daily Telegraph with clues bearing codenames describing the operations and landing site of the secret Invasion of Normandy by the Allies during WWII. I think of crossword puzzles as a fun, brain-teasing way to pass the time. Never did it cross my mind that, at one point, crosswords puzzles could have changed history. During World War II, the secrecy of the 1944 Invasion of Normandy (D-Day) was apparent by the use of codenames. The entire operation had the codename of “Overlord”; the naval operation was “Neptune”; the two beaches where the allies were to land were named as “Omaha” and “Utah”; and the artificial harbor that would be set up was code named “Mulberry”. By coincidence, between May and June 1944, the crossword puzzles in the British Daily Telegraph newspaper contained the codenames as some of the answers to the questions of the crossword puzzle. Eventually, all of the codenames were released and the creator of the puzzles, Leonard Dawe, headmaster at the Strand School in Surrey, England, was arrested on suspicion of conspiring with the Nazis. Years later in 1984, a Ronald French, allegedly one of Dawe’s pupils in 1944, gave his version of events. He claimed on BBC television that it was he who inserted the codenames into the crosswords. Apparently, Dawe used to allow his students to help write the puzzles. French had learned the codenames from US and Canadian soldiers while proclaiming Dawe’s innocence. This was all just one big coincidence! If you are the type of person that buys lots of mementos during a vacation such as souvenirs, clothes, or other items, you should bring an extra carry-on sized bag. You wouldn’t want to have a packing crisis just before you head back home! If you are going on a long road trip, chances are that you can’t pack enough clothes for the whole trip. Furthermore, washing your clothes on the road is a hard thing to do. Think about it: are you really going to hunt down a Laundromat? So if you add a few dryer sheets to your bags, clothes will stay fresh longer! Also, a small spray bottle of Febreze could also come in handy for your clothes and the car! Healthy snacks such as granola bars are a great thing to bring along to settle your stomach when waiting for your plane or driving to the next destination. It will help keep you going! The last thing you’d want to do is pig out on chips and candy the entire time! There are many things you need to bring on a trip; these three tips are just the start of it. You don’t want to forget a camera to capture the memories you and your friends create, a map or GPS to know where you are going, cell phone chargers, and, if needed, a translation book. Always be aware of where you are headed, where you are staying, and how you are getting there. Be sure to have a fun, safe summer! The YouTube channel, Howcast, has created a video focusing on how to pack everything into a carry-on. It may take some time before the earthquake and tsunami that struck Japan in March 2011 really affects America’s car industry, but when it does, here are some things you can expect to happen. Since there were several parts suppliers that got wiped out by the earthquake, there will be less inventory at Japanese car showrooms, in turn, reducing inventory in the United States, which is supplied by Japan. The popular Toyota Prius and other Japanese hybrid cars are already experiencing scarce inventory. In addition, there could be an increase in the demand for used cars. 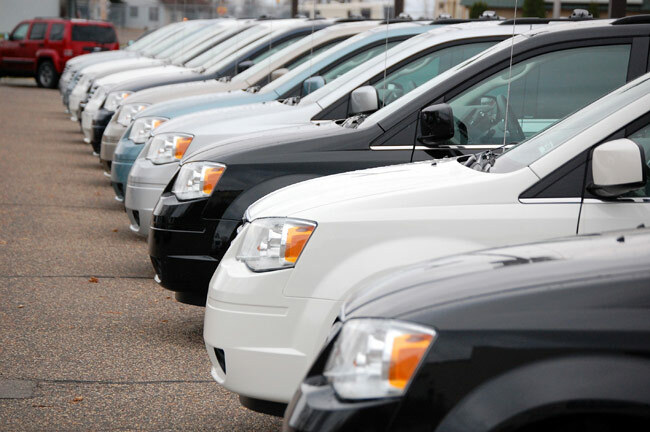 Used car prices may rise this summer if the demand increases. However, this could be good news to those looking to trade their old vehicle for a new car. Finally, a buying frenzy for American cars may occur. There was a large recall on Toyota cars recently, putting the Ford Motor Company in the spotlight. It looks like 2011 may be a good year for Ford, Chevy and Chrysler and other American car makers. Mother’s Day is an annual holiday celebrated on different dates around the world. Countries such as the United States, Germany, Greece, Austria, Australia, Cuba, Brazil, Turkey, and Switzerland, among many others, celebrate Mother’s Day on the second Sunday of May. 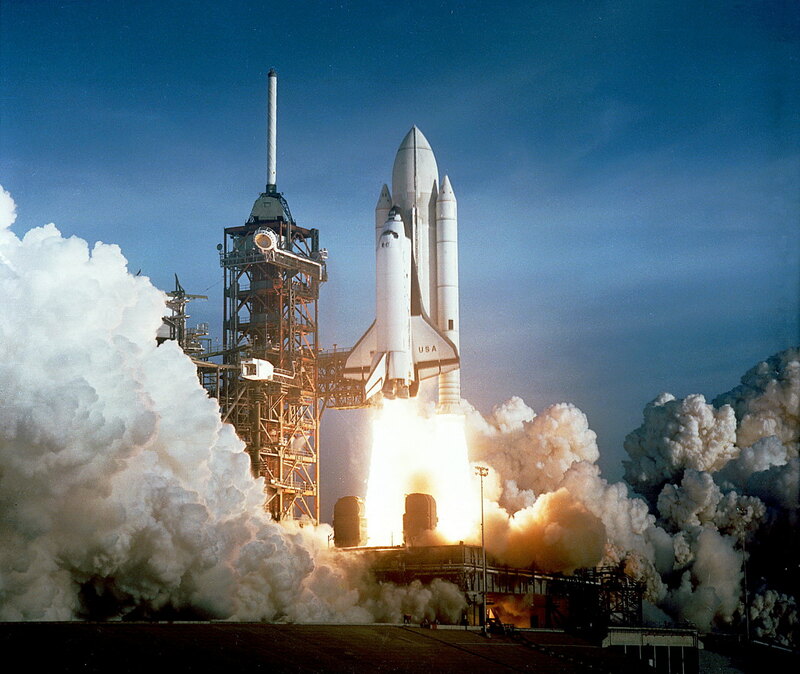 As it turns out, this is the most common time the holiday is celebrated. Some countries celebrate it for religious purposes like Ireland, Nigeria, the United Kingdom, and Bangladesh, as their celebrations fall on the fourth Sunday of Lent. Other countries celebrate the holiday on different dates throughout the calendar year. The holiday is celebrated to recognize mothers, motherhood, and maternal bonds in general. It also recognizes positive contributions that they make to society. While most countries have been influenced by American traditions, making the holiday highly commercialized, in all countries it is a day to give thanks and express the deep-felt gratitude towards one’s mother. 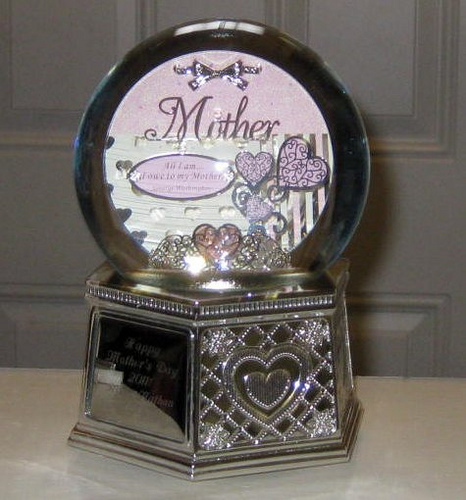 In America, Australia, the United Kingdom and other countries, gifts and tokens of appreciation are given to the mothers. 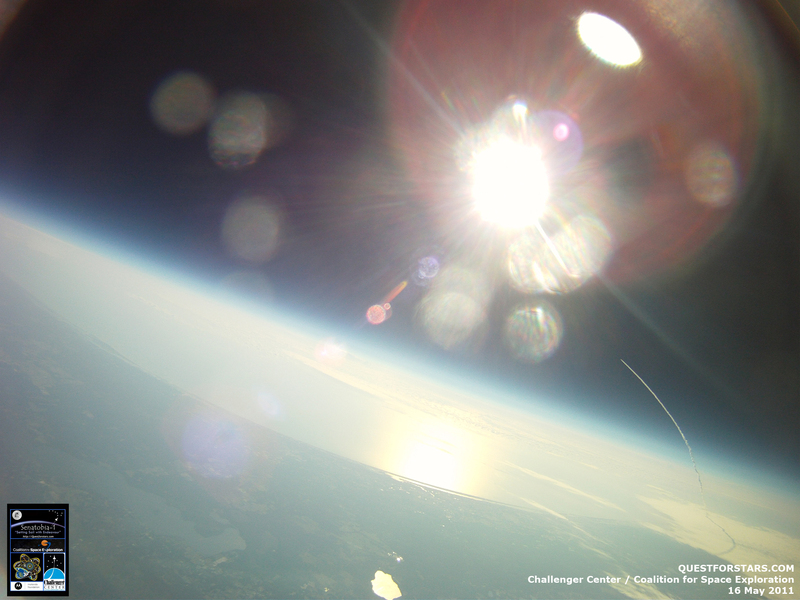 All around the world, Mother’s Day is a day to show your mom that you appreciate her. It can be done in words, a craft, a gift you bought, or activities you plan for her.